Coordinated and overseen by the Federal Emergency Management Agency (FEMA), the Urban Search and Rescue Response System (US&R) consists of 28 advanced task forces strategically located throughout the country. These task forces are available to respond to catastrophic events involving the collapse of heavy steel, concrete and wood frame construction. US&R members are the most highly trained first responders in the nation and their special skills, equipment and techniques allow them to work in extremely dangerous conditions, from natural disasters, such as hurricanes and earthquakes, to domestic terrorist incidents. Because US&R is considered a Rapid Reaction Force, FEMA requires that each task force be ready within six hours' notice for dispatch to anywhere in the country and that they be self-sufficient during the first 72 hours of any emergency response. The National Urban Search and Rescue System was established under the authority of the Federal Emergency Management Agency (FEMA) in 1989. Urban Search and Rescue Task Forces are trained in confined space rescue during national disasters involving collapse of reinforced steel, concrete and wood frame structures. 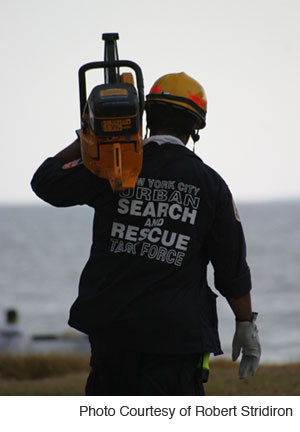 NY-TF1 has been a proud member of the FEMA Urban Search and Rescue Response System since 1992. NY-TF1 can deploy as a Light Task Force (34 people) or as a Heavy Task Force (80 people). NY-TF1 also has members who serve on FEMA Incident Support Teams (ISTs). An IST is activated to coordinate and support US&R assets in the field. NY-TF1 travels with an extensive equipment cache that is vital to its mission. US&R equipment is packed to respond with the team and includes specialized rescue tools, such as search microphones sensitive enough to detect human breathing. The cache also includes personal protective equipment, sanitation and showers, and Meals Ready to Eat (MREs).